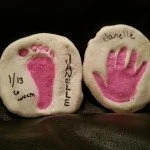 I’ll admit it, I love baby keepsake crafts. My baby is 19 months now and since she was 6 weeks old I’ve been try new keepsake crafts. They are only little for a little while. I want to have as many keepsakes as I can to look back on and remember how little she really was. These also make great gifts to loved ones from your little one. In no way am I a good painter. I love doing crafts but often times they do not come out how I initially pictured them. I have come to belief that, that is part of the charm. Canvases were on sale at Michael’s (arts and craft store) so I decided to try this craft I saw on Pinterest. Step 1: Paint a sun at the bottom of the canvas. Step 2: Paint your child’s hand and place them around the sun. They will be the sun’s rays. Instead of just hands you can alternate your child’s hand and foot. 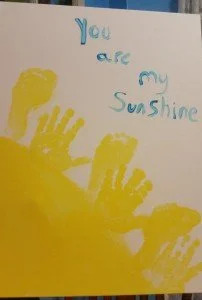 Step 3: Write in blue paint you are my sunshine. I absolutely loved how this came out. Step 1: Draw a picture of a leaf on a piece of paper or print a leaf template out. Step 2: Have your child color in the leaf or if they are too young color it in for them. Step 3: Paint tiny circles on each toe of one foot. You can use different colored paint for a colorful caterpillar or green. Step 4: Press your child’s foot onto the leaf and let dry. Step 5: Draw legs and a face on the caterpillar using a black sharpie or marker. 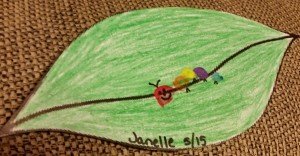 Optional Step 6: Laminate finished caterpillar (if you don’t have a laminator you can bring the project to a teacher supply store and they can laminate it for you). I recommend laminating the project if you are giving it as a gift or would like to keep as a keepsake. You can also glue a magnet to the back. 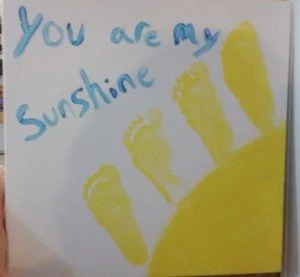 Who doesn’t love their little ones tiny hands and feet, know you can look back at them forever with this easy hand and foot craft. This craft is not only good for infants but also young children. It makes a great Christmas, Valentine’s or Birthday gift for parents and special people in that child’s life. 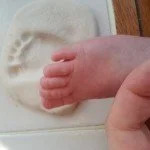 Follow the step-by-step directions below to make your own handprint/footprint craft. 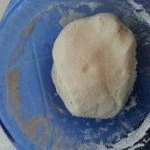 Step 2: Flatten out the dough using hands make two circle shapes big enough to fit the child’s hand and foot. You can use a rolling pin and circle cookie cutter to make it easier if you like. Circles should be 1/2 to 1 inch in thickness. Step 3: Take the baby’s foot and press down into the center of the circle. On the second circle repeat with hand. You may need to do this a couple of times before you get it right. Step 4: You can either let the clay air dry for 2 days or bake the dough at 275 for 50 minutes or until bottom no longer has a doughy feel to it. I really enjoyed making this photo collage. I made it for myself as a Mother’s Day/Baby Keepsake. It was also my first time using Mod Podge. I found it pretty easy to use. If you have never used or heard of Mod Podge it is easy to find at any craft store. I decided to make this photo collage because I wanted something different I can hang on the wall to represent my daughter’s first ear of life. 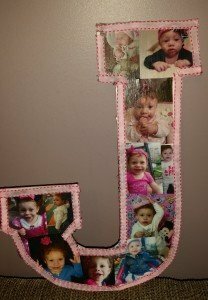 I was going to Mod Podge the pictures on to the letter M for Mom but decided to go with a J for my daughter’s name Janelle. Step 1: Print out a couple of your child’s pictures in different sizes. They can be either black or white or color. Photo paper is not needed. In doing this project I found that regular printer paper works best. I printed out some of my favorite pictures of my baby from birth through age 1. Step 2: Cut of the pictures and place them over the letter so you know exactly where to place the photos. Step 3: Start brushing the mod Podge on to the letter then placing your photos. Continue until you have all the photos on. Step 4: Lightly go over the pictures with Mod Podge. The Mod Podge will look white but will dry clear. Step 5: Let dry completely. I let mine dry overnight. After it is dry make sure that the pictures are completely stuck to the letter. If they are not, add another layer of Mod Podge. Step 6: Hot glue ribbon all around the letter. Enjoy! You can hang your picture collage on the wall using Command Photo Hanger Strips.